Detailed review of Pureology Fresh Approach Dry Shampoo. See what real experts and actual users have to say about this dry shampoo. 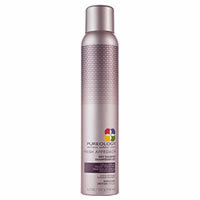 Pureology Fresh Approach Dry Shampoo is a great dry shampoo that lasts all day long. This dry shampoo is really easy to apply and very easy to use, but the one downside of this product is how much you have to put in your hair to absorb the oil. The product takes about 4 applications to absorb the oil, but once it does, it works really well and lasts all day long. The look and feel of this dry shampoo is a super fine texture and has a slight white tint that goes away once you work it into the hair. Pureology Fresh Approach Dry Shampoo also smells amazing, strong and sweet, and will last in the hair all day long. Besides for keeping my hair oil free for 11 hours, it also added texture and volume which lasted all day as well. Overall, Pureology Fresh Approach Dry Shampoo is a great dry shampoo that kept my hair fresh and styled all day. I just wish I didn’t have to use so much product in my hair, especially because it’s a bit pricey. The look of Pureology Fresh Approach Dry Shampoo when you first apply it to your hair is totally invisible. As the product dries, it has an ever so slight tint of white to the powder, but overall it’s very undetectable in the hair. It feels like a very soft and fine powder that basically just melts into the hair. The application of Pureology Fresh Approach Dry Shampoo is really easy; the aerosol applicator makes it apply evenly and doesn’t come out too fast. It’s also really easy to use, but since the product is so fine, you have to apply a lot of product. Since the product was basically disappearing into my hair, I found myself applying about 4 layers of product before it absorbed the oil. Pureology Fresh Approach Dry Shampoo applies damp and it takes about 20 seconds to dry down. I absolutely love the smell of this dry shampoo; it has a strong sweet fragrance, but not too strong. The smell will stay in your hair all day long, which I really loved. The results I achieved from Pureology Fresh Approach Dry Shampoo were great. Once there was enough product in my hair, it absorbed all the oil and still didn’t look to cakey or gross. It also added a good amount of volume and a little bit of texture to my hair which helped keep it looking styled. Pureology Fresh Approach Dry Shampoo lasted about 11 hours in my hair. I was impressed with the amount of time this lasted. I didn’t know if it would last because of the texture and consistency of this product so I was happily surprised. After 11 hours, I didn’t feel the need to reapply since the day was almost over. I was happy with the amount of time it kept my hair looking clean and styled. Pureology Fresh Approach Dry Shampoo is $24.00 for 4.2 oz. That comes out to $5.71 per oz. That is a little bit of a pricey dry shampoo, but it was to be expected for the brand name and quality of the product. Unfortunately, I couldn’t find a money back guarantee for Pureology Fresh Approach Dry Shampoo. To buy Pureology Fresh Approach Dry Shampoo, Click Here.